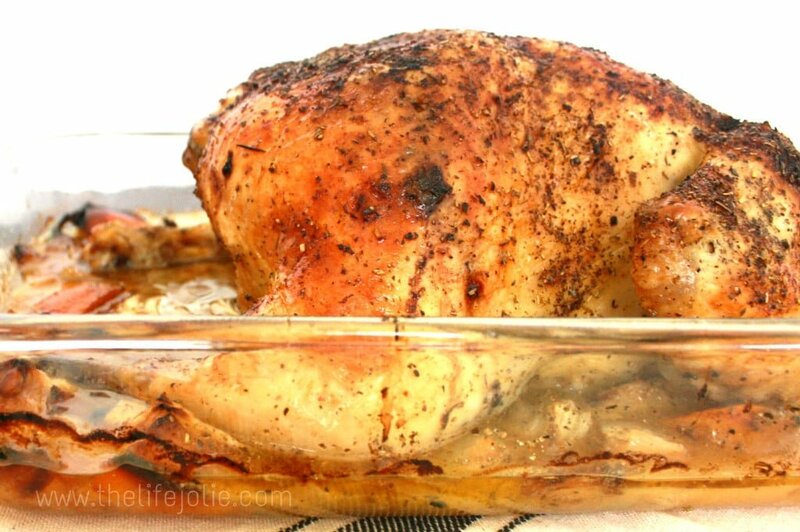 This is the most simple delicious whole roast chicken recipe- there is no extra, unnecessary work but the results are super delicious- even the white meat is super tender and succulent! This recipe is fool-proof! 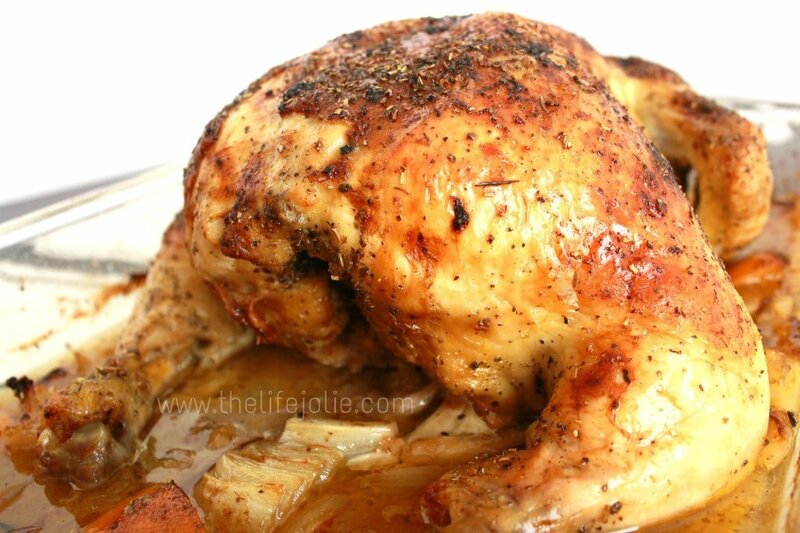 There is something so traditional, so classic about whole roasted chicken. It is very easy to throw together and yet it still has the “wow factor” that you want when you cook for guests. Whole roasted chicken was intimidating to me for such a long time. There were the concerns about over-cooked white meat, trussing, brining, basting…my head is spinning just thinking about all of it. But one day, I said “screw it” and bought a bird and I just cooked it. There was no brining or trussing. I didn’t even own a baster (though I received one 2 Christmas’ ago in my stocking and promptly lost it). In terms of seasoning, I followed my instincts. Once it had cooked up to the required 165 degrees and was a lovely golden brown, I crossed my fingers and cut into it. To my surprise, I had cooked my little chicken upside down. As in the breast was down. Oops. Luckily for me, the ultimate crispy-skin-enthusiast, there was plenty of crispy skin available. When I tasted that chicken breast I was hooked. It was perfectly tender and moist. And I don’t even like white meat! After that, I never cooked the breast side up again. I’ve made this chicken so many times and it is easy and consistently delicious. Cooking times will vary with your oven, but temp it starting around an hour and then check it every 10-15 minutes after until the thigh temps out at 165 degrees (make sure you don’t hit the bone!) and don’t forget to let it rest for at least 10 minutes before carving it!. Spray a 9″ x 13″ baking pan with cooking spray and spread most of your onions, lemon chunks and garlic cloves (reserve a few for the inside of the chicken). Stuff the chicken with the remaining onion, lemons chunks and garlic and season the cavity liberally with salt, pepper and herbs de provence. Be sure not to over stuff the chicken, you don’t want it to be completely full. Rub the breast side of the chicken with olive oil and then season liberally with salt, pepper and herbs de provence. You can also put some seasoning under the skin, especially if you’re working with fresh herbs. I was lazy today and didn’t do this. The chicken was still amazingly delicious and flavorful. Place the chicken, breast side down into the pan. Rub the other side of the chicken with olive oil and squeeze your two lemon halves all over the chicken. Season liberally with salt, pepper and herbs de provence. At this point I usually give a quick spray of cooking spray over the top and pop the bird into the oven. Roast for around an 50-90 minutes. The exact time depends on your oven. In my old apartment it usually reached temp around an hour. In my current oven, it takes around 1 hour and 20 minutes. The thigh should temp out to 165 degree, make sure you don’t hit a bone. You can find a full index of recipes here. Monday: Mom-2-Mom Link up, Monday Madness, Motivation Monday, Mix it up Monday, Inspire Me Monday, Frugal Crafty Home. March 4, 2015 at 12:49 pm Thank you- the house smelled incredible! Enjoy! March 4, 2015 at 11:10 pm I am a crispy-skin-enthusiast too; nothing beats a roast chicken, except maybe two of them. Whole chickens are the cheapest form of meat for us, and I will often roast two at once and use the leftovers in salad, pasta, or casseroles. Your recipe looks delicious. I am visiting from Think Tank Thursday. 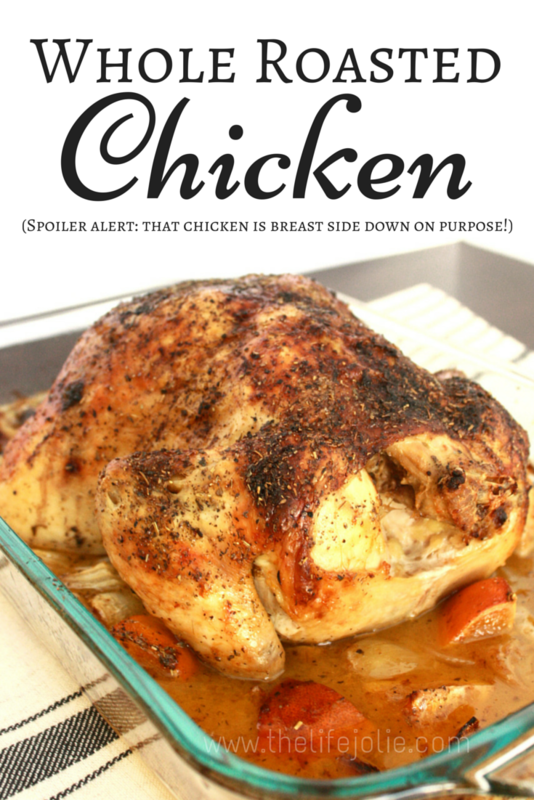 March 6, 2015 at 10:20 pm Your chicken looks delicious. 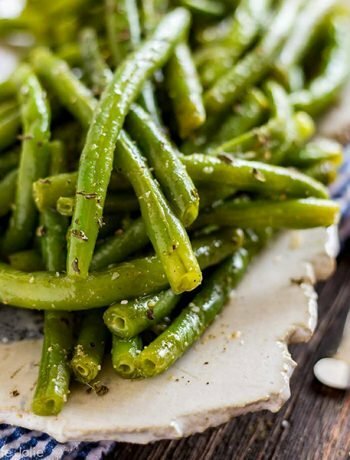 Thanks for adding your recipe to Foodie Friday and E.Else! March 8, 2015 at 9:44 pm Thank you so much! March 8, 2015 at 9:44 pm Thank you- I hope you enjoy ! March 11, 2015 at 9:07 am Thank you so much- it's probably one of my favorite things to make because the people I love enjoy it. One of the ways I like to show my love is by cooking for the people that I love. March 11, 2015 at 12:08 pm Thanks for stopping by- I hope you enjoy!